This back-to-school season will be as easy as 1-2-3 with a little help from General Mills, Crayola, and Target, the one-stop-shop for all your back-to-school needs! Head to the front of the class and check out www.GrocerySavvy.com where you’ll find even more coupons for back-to-school, recipes, and a special 2012 “Grocery Savvy Crayola® Back To School” Sweepstakes! Easy entry! Just leave a comment below telling me which General Mills and Crayola products they are most excited to see participating? * Be sure to leave a valid email for your entry! Become a Friend (follower) of this blog ---> with Google Friend Connect! Winner will be notified by email. Contest ends 8/29/2012 at 11:59 pm. Winner must email back with proper information with in 48 hours. Contest opened to USA residents only, random.org will be used in selecting winner. 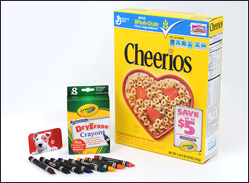 Crayola, General Mills, and Target provided mewith the free product, information and gift pack through MyBlogSpark. All opinions expressed are my own! I'm excited to see Honey Nut Cheerios and crayola crayons. I follow A Rup Life on Facebook as Mary Happymommy. I follow As They Grow Up on Facebook as Mary Happymommy. I am excited to see honey nut cheerios participating. Hi lisa, I just found your cute blog. We love the Honeynut Cheerios and My First Crayola Busy Bag Art Kit. Thanks for letting me enter. I A Rup Life on facebook as Tracy Suzanne. I'm also following As They Grow Up on fb. I shared the giveaway on fb. I tweeted about the giveaway too. I'm most excited about seeing Cheerios and Crayons participating! We eat cheerios like crazy! Honey Nut Cheerios and Crayola 64 Ct. crayons. wow... thank you for sharing this! I'm excited to see Nature Valley Granola Bars and Crayola Crayons. I like As They Grow Up on Facebook. I'm excited to see Cheerios and crayola crayons. I'm happy to see Cherios. Honey Nut Cheerios and colored pencils. I'm glad to see Lucky Charms and Crayola crayons! I follow As They Grow Up on facebook. I follow A Rup Life on facebook. Cheerios and Dry Erase Crayons! I'm excited about Honey Nut Cheerios and Crayola Washable Markers. I follow you on Twitter @mgoss123. I am excited to see the Toaster Studels and the Dry Erase crayons! I would have to say Nature Valley granola bars and Crayola crayons. thank you! I'm excited to see Chex Mix snack mix. We love Lucky Charms & Crayola colored pencils! Crayola crayons & Cinnamon Toast Crunch! I follow on gfc ohsmiledarling at gmail dot com! Welcome! I'm Lisa, owner of this blog. I've been married to my best friend John for over 18 years and together we raise our 4 boys. We are a homeschooling family of faith and enjoy spending time together. A Rup Life is a participant in the Amazon Services LLC Associate Program, an affiliate advertising program designed to provide means for sites to earn advertising fees by advertising and linking to Amazon.com. I'm Going to Heaven Can't Wait! I want to ask you the question... If you died today do you know where you would end up? Would it be in Heaven or Hell? Do you have a reason for that? Is it because you are a good person? Because you help others? Do you have a Bible reason for going to Heaven? The bible says there is one way for you to get to Heaven and that is through Jesus. I encourage you to Ask Jesus to save Your soul today. I did many years ago and I couldn't be happier with the peace and love from God I feel everyday. All content (this includes all text, photos, videos and design work) is © Lisa Rupertus. My original artwork is shared for personal inspiration only and is not to be copied for publication or contest submission. Feel free to link to my blog! Thanks! !